I have a t-shirt from Grace Hopper 2010 in Atlanta. 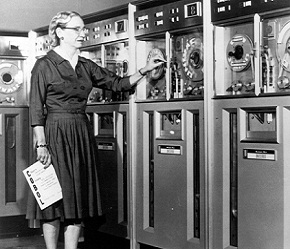 The t-shirt (I believe it was the one from Google that year) has the famous picture (shown here) of Grace Hopper and the UNIVAC. Recently my daughter started asking me “who is the lady on your shirt, Mommy?” when I wear the shirt. Usually I just say “That’s Grace Hopper. She was a famous computer scientist.” Yesterday she pressed me for more info, so I explained a bit more about who she was, how she was one of the first computer programmers, etc. I showed her the clip of Grace Hopper on David Letterman. During this whole exchange, my son sat nearby, listening intently. Now where did I put that Ada Lovelace shirt…. ?